NetHelpDesk (NHD) has it's own integrated Google Calendar feature, that allows you to make appointments and tasks within requests, and in it's own separate area, and merge with your Google Calendars elsewhere. By Customer demand, we have allowed the amazing calendar and appointments functionality in NetHelpDesk to be compatible with Google Calendars, as well as other popular choices, such as Microsoft Exchange, MDaemon, and Microsoft Office 365. Everything from request related appointments, separate or project tasks, personal events, meetings, annual leave, all collated together, and managed in the one place for each login. Set reminders, book for multiple logins, inform users, use approximate arrival times, make private and much more. Appointments/Tasks from ticket to multiple calendars, 2-way updating. Create appts in calendar view whilst overviewing existing appointments. Each login has own colour for easy visual identification when scheduling. Add subject line independent of ticket content for clear directives. Reschedule appointments time, date and assignee in multiple areas. Extend or reduce time of appointment from Calendar like Outlook. Specify start date, start time, end date and end time of appointment. 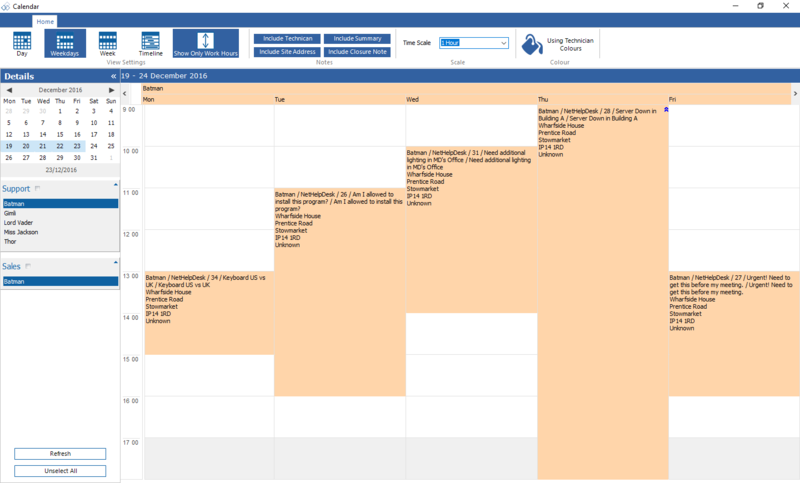 Adds appointments to a single central merged NHD calendar view. Alternative individual accounts in one screen for comparisons. Define active start and active end of the day, like Outlook. Subject line, location and body with relevant ticket data using $variables. Auto-create calendar entries for actions on tickets, whilst adding notes. Import calendars from Exchange/Google/Office for true schedule overview. Choose number of days (past and future) to import into the calendar view. Set to PRIVATE outside of NHD, time booked out, but content stays hidden. Send e-mails so all kept informed of work assigned to/for them. Choose number of days to display in Calendar view, show/hide weekends. Change time intervals to 0.5 hour, 1 hour or 2 hour as needed in calendar. Include site address in location, and main entry note in calendar booking. Print calendar view for reporting purposes, meetings, take on the road. Whether it's to call your end user back, schedule actions internally, or site visits. Whatever the reason, schedule your multiple appointments from within the ticket. Add the Subject for the appointment, start date and time, end date and time, indicate if confirmed with the relevant parties, and which Agent it is applicable to. NetHelpDesk will then push your appointments out to your Agents' calendars. This amazing, intelligent 2-way functionality works with both Exchange Calendars on your domain, Office 365 or Google Calendar. Each Agent has their own NHD calendar in the help desk software. 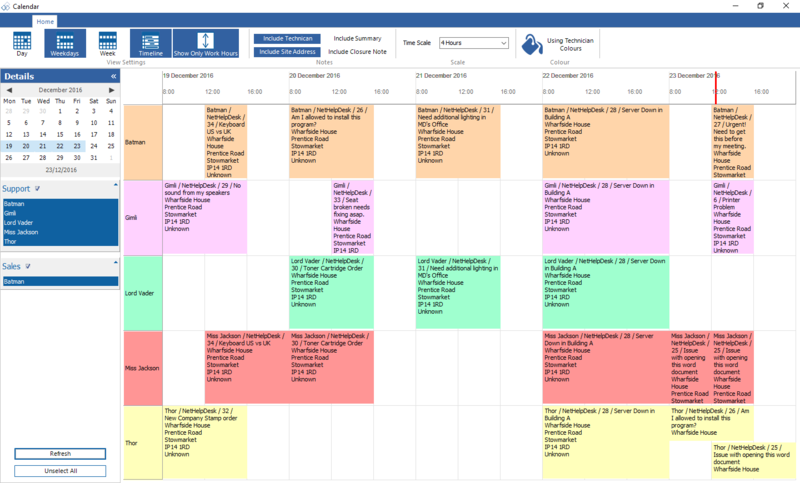 These can be viewed separately, or collectively in a group NHD calendar from the main screen. 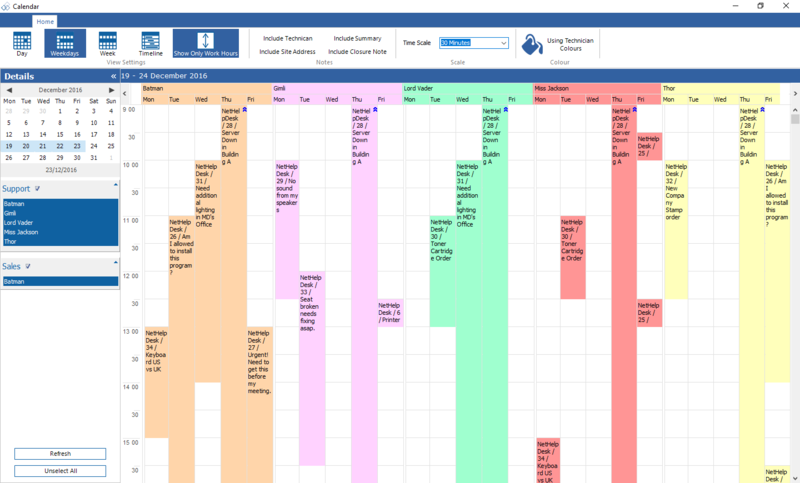 NetHelpDesk has its own centralised calendar, where each Agent can have their own calendar, or you can group Agents appointments together, with personalised colour selection to identify. You control what information comes out of the ticket and into the NHD calendar entry using $variables of multiple data fields from the database.The intelligent 2-way updating allows you to update in one place, to update the other. So, if you update the calendar time/date in your calendar, it will update your NHD calendar. If you update the appointments in the ticket, it will then update both your NHD and regular calendars. NHD will inject your Agent appointments to the specified calendar, and all of the ticket data you specified as well. If your calendar account is synced with your Smartphone, your entry will be injected automatically, so your NetHelpDesk appointments are in with all your other appointments. If you update who's assigned to the call, it will update your NHD and regular calendars. NHD handles all the hard work for you. It removes the appointment from the former Agent's external Calendar, removes the appointment from the former Agent's NetHelpDesk Calendar, then adds the appointment to the new Agent's NetHelpDesk Calendar, and adds the appointment to the new Agent's Google Calendar.